making its debut in Geneva this week. The Continental Supersports is the fastest and most powerful Bentley ever. It is the extreme Bentley, a 'muscular' two seater that delivers super car performance and a highly focused driving experience. The Supersports is also the first Bentley capable of running on both petrol and biofuel, pioneering the use of FlexFuel technology in the luxury sector. This represents stage one of the company’s commitment to make its complete model range compatible with renewable fuels by 2012. Available worldwide from Q3 2009, the Continental Supersports will be FlexFuel compatible in the majority of markets from launch with North American cars offering the capability by (northern) summer 2010, following regulatory approval. The results are dramatic. With 621 bhp and new ‘Quickshift’ transmission that halves shift times, the Supersports sets new performance benchmarks for Bentley. It accelerates from 0-100 km/h in 3.9 seconds and onto a top speed of 329 km/h (where legal - and safe). Agility is further sharpened by the 40:60 rear-biased torque split for the all-wheel drive system, a wider rear track, bespoke light weight 20-inch alloy wheels and a unique electronic stability programme. Carbon ceramic brakes are standard fitment, benefiting steering response, grip and ride comfort, while saving weight. Overall, the engineering team have achieved a weight reduction of 110 kg compared with the Continental GT Speed. Similarly, new flared rear guards that accommodate the 50 mm (2 inches) wider rear track are designed to emphasise the powerful stance of this ultra-high performance coupe. The resultant Supersports style combines the looks of the iconic Continental GT with a new and distinctive appearance that reflects its more extreme 'character'. The Supersports is further distinguished from its Continental coupe 'stable mates' by a unique dark-smoked steel finish to all exterior ‘brightware’, including front grilles, lamp bezels, window surrounds and wheels. A complex ‘Physical Vapour Deposition’ process is applied to all stainless steel components to give a lustrous and highly durable finish. A car industry first, this process is normally used as a coating on industrial tools, watches and even hip replacement joints. Fully embracing the extreme spirit of the Supersports, Bentley’s interior designers have provided a unique ambience. The cockpit represents a dramatic re-interpretation of Bentley interior design in which carbon fibre and AlcantaraTM not only convey a sporting and contemporary style but also reduce weight. The Bentley Continental Supersports is capable of running on either petrol and E85 biofuel or any combination of the two. E85 biofuel can offer a reduction of up to 70 per cent in CO2 emissions on a ‘well-to-wheel’ basis. The ‘Supersports’ name is inspired by the original two-seater 3-litre Supersports model introduced in 1925, itself an evolution of the 3-litre Speed. The light weight, 85 bhp Supersports was the first production Bentley to reach 100 mph and was also renowned for the application of Le Mans-winning race technology. A Fuel Quality Sensor detects the blending ratio of the fuel in real time sending a signal to the engine control unit (ECU), initiating the correct engine mapping. This ensures all performance parameters remain balanced and consistent. 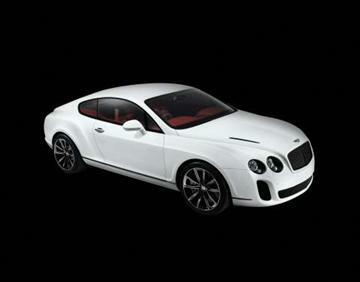 For the Continental Supersports, Bentley engineers have made the most powerful engine in the company’s 90 year history. Bentley’s renowned 6-litre, twin-turbocharged W12 now develops 463 kW at 6,000 rpm, an increase of 3.5 per cent compared with the Continental GT Speed. Maximum torque of 800 Nm, up by 6.7 per cent, is achieved from 1,700 rpm across virtually the entire rev range for effortless power delivery. The extra power and torque resulting from the increased turbocharger boost necessitated a 10 per cent increase in air flow to the intercoolers and radiators following an extensive programme of Computational Fluid Dynamics. Dramatically-styled front air intakes feed the intercoolers behind, while twin bonnet vents ensure positive extraction of hot air above the engine. These changes also help to increase downforce at the front, balanced by the addition of a re-profiled spoiler on the rear aerofoil with a raised rear edge. During upshifts, fuel and ignition are cut momentarily to give faster mechanical shift times through torque reduction, also improving shift quality and durability. Positive torque during downshifts is achieved through engine and gearbox electronic controller interaction for extra throttle and fuel injection during the overrun. This replicates manual throttle ‘blips’ for precise rev matching and helps double downshifts for enhanced response. Acceleration times are improved, response times throughout the whole gear range are enhanced and engine braking can be better exploited during enthusiastic driving. The result is a driving experience with a sportier feel and sound. To cope with the additional power and torque, the planetary gear set of the ZF transmission is also strengthened. The increased power and torque, ‘Quickshift’ transmission and a 110 kg reduction in weight endow the Supersports with a top speed of 329 km/h and a 0-100 km/h in 3.9 seconds. It accelerates from 0-160 km/h in just 8.9 seconds. At the 2008 Geneva Motor Show, Bentley announced a far-reaching environmental programme to reduce CO2 emissions and improve fuel economy across its model range. An important element of this strategy is by 2012 to make the entire Bentley fleet capable of running on renewable fuel through the introduction of FlexFuel technology, where engines are capable of running seamlessly on bioethanol, petrol or any mix of the two. At the same time Bentley declared that this would be achieved without sacrificing its well-known performance and luxury. This statement of intent has taken shape in the Continental Supersports – a car that balances extreme potency with the pioneering use of biofuel technology in the luxury sector. The result is a net CO2 reduction of up to 70 per cent on a well-to-wheel-basis, the measurement of CO2 release of a fuel from its production (well) to its combustion or deployment (wheel). Bioethanol is often blended with petrol in a variety of percentages ranging from E10 (10% bioethanol) to the most widely known, E85, blended at a ratio of 85 per cent bioethanol to 15 per cent petrol. Bioethanol can be derived responsibly from crops such as corn, soybeans, sugarcane and switchgrass. Second generation bioethanol uses the non-food fibres of the plant (biomass), as well as agricultural waste and forestry residues. These are collected and refined into cellulose ethanol. CO2 is absorbed by plants as part of the photosynthesis process, and cars using biofuel then release that CO2 back into the atmosphere, thus providing an unbroken energy cycle. In addition, biofuels are not derived from fossil fuels, making them a renewable resource ensuring a secure supply into the future. Bioethanol is often blended with petrol in a variety of percentages ranging from E10 (10% bioethanol) to the most widely known, E85, blended to a ratio of 85 per cent bioethanol to 15 per cent petrol to ensure cold-start capability. Bioethanol presents unique engineering challenges compared with petrol, due to its chemical composition and characteristics. E85 biofuel has a very high octane rating of 105 but a lower energy content that requires a 30 per cent increase in the engine fuel flow rate. This necessitated a complete review of the fuel system to identify, and if required replace, components deemed to be insufficiently resistant to the corrosive properties of ethanol. For the fuel system all O-rings, seals, gaskets and pipes are new. In addition, increased fuel flow is achieved through a returnless fuel system and twin variable flow fuel pumps for the engine. The use of bioethanol also requires new valve coatings and hardened valve seat material for additional lubrication, a new closed-loop fuel rail design with pressure sensor for higher fuel flow rates and new spark plugs with a wider heat range for slower combustion. The W12 6-litre power unit has the technology to run on petrol, E85 or any mix of these two fuels. A new Fuel Quality Sensor in the fuel supply circuit detects the current mix of petrol and bioethanol in real time. The engine control unit instantly initiates the correct engine mapping to ensure all performance parameters remain balanced and consistent. Power and torque remain constant whatever the ratio of petrol to bioethanol. The Continental Supersports’ high performance is complemented by an array of chassis enhancements and weight reductions to deliver a highly focused driving experience with the emphasis on grip, agility and response. The complex, four-link front suspension features not only high stiffness aluminium uprights, but now light weight aluminium forward levers (saving 4 kg/8.8 lb). New double-stiffened bushes are fitted at the inboard mounting point to improve steering response and feedback. A new hydraulic bush for the trailing link is 33 per cent stiffer to improve response and has a revised damping peak for better control of fore-aft wheel movement. The anti-roll bar geometry is retuned for improved roll stiffness, while the Servotronic speed-sensitive steering system is tuned for sharper turn-in, improved feel and linearity. The front and rear suspensions benefit from changes to the electronic control strategy of the Continous Damping Control (CDC) system that improve body control. In common with the Continental GT Speed, the Supersports’ suspension is lowered by 10 mm at the front and 15 mm at the rear for optimal handling. Agility is further sharpened by a revision to the continuous all-wheel drive system, which provides exceptional traction in all weathers. As before, the drive is transferred between the front and rear axles automatically via a highly sensitive Torsen centre differential which automatically sends more power to the wheels with greater grip. For the Supersports, the standard 50/50 front/rear torque split is replaced by 40/60 split with a rear-bias. This provides for better modulation of line and attitude by ‘throttle steering’ as well as neutral acceleration out of bends. The Supersports is fitted with unique, light weight 9.5J x 20-inch forged alloy wheels, offering a total weight saving of 10 kg per car. These reduce both unsprung and rotating mass while the open 10-spoke design offers superior brake cooling. The rear wheels have a 25 mm greater offset resulting in a 50 mm increase in the rear track, further benefiting handling and stability. The new wheels are fitted with 275/35 ZR20 Pirelli Ultra-High Performance tyres, shared with the Continental GT Speed and provide excellent steering response. The wider rear track further enhances the already high level of grip. To ensure optimum aerodynamic balance at speeds of up to 329 km/h the Supersports is fitted with a re-profiled automatic spoiler which deploys at 80 km/h. The Supersports is fitted with Bentley’s carbon-ceramic brakes as standard – the largest and most powerful ever fitted to a production car. The large diameter (420 mm front, 356 mm rear), light weight discs and eight-piston callipers offer fade-resistant braking performance with minimal disc distortion under high thermal conditions. A 20 kg weight saving reduces unsprung and rotating mass, benefiting steering response and handling. Pedal feel is also improved with shorter travel, high effectiveness and a precise pressure point. The standard-fit tyre-pressure monitoring system allows drivers to select tyre type and speed range parameters. As well as monitoring pressures, the system warns drivers if their speed is too high for the tyre pressures or if tyre speed ratings are exceeded on winter tyres. The Supersports features an advanced electronic stability programme (ESP) that exploits the potential of the more powerful engine and enhanced chassis, improving driver interaction and control. The new ESP also provides faster reinstatement of engine torque after intervention for improved agility. The target slip is increased at greater than 90 per cent throttle to utilise all available longitudinal grip. Corner exit agility is thereby enhanced for increased driver involvement. The Bentley Continental Supersports was not found in market research. It started out as a kind of ‘under the radar’ project’ with a team of four engineers investigating the additional performance potential of a lighter weight Continental GT. Driven by this small, highly-motivated group of Bentley engineers the project gathered momentum. The team sought to provide a rear-bias for the power delivery and also raise that power to make the fastest and most powerful Bentley ever. The design team was then briefed to make the new car ‘extreme’. The evolution of the Supersports’ design was a clear case of form following function, the purposeful sculptural forms signalling the engineering revisions beneath the skin. At the front, Supersports has a simple ‘letter box’ centre air intake flanked by two vertical grilles which give the car dramatic differentiation, making it seem wider (and therefore lower) while feeding a larger volume of cooling air to the intercoolers. Two new bonnet vents extract hot air from the engine bay. At the rear, the subtly curved wheel arches are extended by 25 mm each side, necessitating newly tooled panels, to accommodate the increased track of the uprated chassis. They provide the Supersports with a truly 'muscular' stance, complemented by the new light weight, 20-inch, 10-spoke alloy wheels. The very open design allows a clear view of the carbon ceramic brake discs and callipers. A new bumper with a black finish to the lower valance, houses larger (+ 40 mm), unique elliptical exhaust pipes with a discreet vertical divider. The Supersports is further distinguished by a unique dark-smoked steel finish to all exterior ‘brightware’, including front grilles, lamp bezels, window surrounds and wheels. A complex ‘Physical Vapour Deposition’ process is applied to all stainless steel components to give a lustrous and highly durable finish. A car industry first, this process is normally used as a decorative coating on watches and machine tools. Four new exterior colours are available exclusively for the Supersports – pearlescent Ice and Quartzite and a first for Bentley, two matt finish colours, Light Grey Satin and Dark Grey Satin. Supersports customers will also have a choice of the 17 ‘standard’ paint colours. The new Continental Supersports will feature subtle external model badges incorporated in the smoked steel trim strip behind each wheel on the lower front guards. Fully embracing the extreme spirit of Supersports, Bentley’s designers have designed a unique ambience for the interior of this most ‘driver focused’ of Bentley cars. They have crafted a dedicated two-seat cabin that blends traditional leather hide with three new materials for Bentley – carbon fibre, AlcantaraTM and ‘Soft-Touch’ leather. Traditional Bentley craftsmanship and fine detailing is retained but given a very different interpretation. Light weight carbon fibre replaces wood veneer on the fascia and centre console, while the new light weight front sports also feature a carbon fibre clamshell back. The rear seats are replaced by a stowage deck area with a carbon fibre luggage retaining beam. A visible weave in all the carbon fibre components has a ‘Bentley-specific’ density and all the parts are finished at the company’s Crewe wood shop. The all-new light weight sports seat frames are manufactured to a Bentley specification and assembled and trimmed at Crewe. The cushion angle is fixed but the seat can be raised/lowered by 40 mm by the dealer who will tailor each car to its owner’s stature. The new seats have regular fore/aft movement, backrest recline adjustment and a heated cushion and backrest which tips forwards to provide access to the rear compartment. The new seat makes a significant contribution to the weight reduction target by saving a total of 45 kg versus the Continental GT Speed. As the new sports seats do not have integrated belts, the top seatbelt anchorage was moved to the B-post. The Continental GT’s twin centre armrests were replaced by a wider, single armrest above an enlarged centre console storage unit. The headlining, rear compartment and the seat centre panels are finished in AlcantaraTM, a high quality suede-like material. The AlcantaraTM applied to the rear compartment and seat facings is quilted and in the Supersports marks the return of the much smaller ‘diamond’ upholstery pattern from Bentleys of old. To further highlight the car’s sporty nature, the steering wheel and gear lever are trimmed in a new ‘Soft-Touch’ leather with extra grip for a racing car feel. The predominant interior colour is black with Beluga secondary hide and Anthracite AlcantaraTM. Customers however can personalise their interior by choosing between Single and Duo Tone themes. Single Tone interiors feature primary and secondary hides in Beluga (black) and can be tailored to customer preference with a choice of contrasting stitching and piping (defining the seat edges) in seven colours – Newmarket Tan, Hotspur, Saffron, Linen, Portland, Porpoise or Beluga. Duo Tone interiors offer a choice of three colour combinations with the primary hide in Newmarket Tan, Porpoise (grey) or Hotspur (red), the secondary hide in Beluga and the rear compartment and seats faces trimmed in Anthracite AlcantaraTM – as they are in the Single Tone cars. These innovations are complemented by drilled alloy foot-pedals and ‘Supersports’ logos to the polished treadplates.